Whether you’re a yogi in training or if you’ve been practicing for the past five years, memory foam mats could be your next gift from heaven. Memory foam yoga mats are gaining popularity with yogis around the world. This is partly because of their durability, but it’s most because memory foam mats are incredibly comfortable. KindMat is a yoga brand which sells the best memory foam yoga mats. We’ll go over exactly how these mats perform and why ou might consider buying one. Then, we’ll offer one slightly cheaper alternative, but make no mistake. Memory foam yoga mats are a luxury item. KindMat’s Memory Foam Yoga Mat is a special, premium product. KindMat’s motto is, “Feel the yoga, not the floor” and they are, currently, the only three-layered yoga mat that is made of memory foam. Let’s first talk about the memory foam. The middle layer is made of memory foam. While you’re still provided with support from the ground beneath you, this layer relieves your joints and muscles from the pressure that is put on them from having to hold you up in different asanas. The memory foam is quite thick, and you can choose from 1-inch mat or 1/2-inch mat versions. The Bliss version is the extra thick one. If you have read our discussion of yoga mat thickness, you might be surprised that such a thick mat can be used for yoga. It works in this case because memory foam has special properties. It compresses, yet still provides great stability. That’s why true memory foam is usually quite heavy. If you have owned or seen memory foam pillows and mattresses, you know exactly what we are talking about. The compression is very different from regular foam. 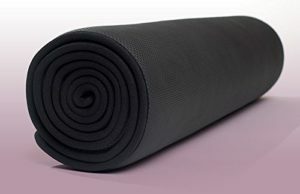 This allows a thicker memory foam yoga mat to avoid the pitfalls or other too thick mats. It’s important to note that some other online brands advertise a memory foam yoga mat for very low prices, like around $20. These are not real memory foam, and you get what you can pay for. Again, if you’ve ever touched a real memory foam pillow, that same type of material is only found in high-end memory foam yoga mats like the KindMat. If you’ve never tried a memory foam yoga mat, this might be the one time to splurge for a somewhat pricier option. KindMat promises to completely change your yoga experience, and your joints will feel better than they ever have before. In addition, those of you with tendinitis, carpal tunnel, or other joint problems who have avoided yoga out of fear of pain should give this mat a try. The top layer of these yoga mats are water-resistant. This is a major benefit to those of us who sweat like crazy when we transition from asana to asana. Everyone hates trying to hold downward dog and feeling their hands and feet moving farther and farther apart. This layer is also easy to clean. The bottom layer is the one with the most grip. When you jump into plan, you don’t want your yoga mat to fly to the side because, quite frankly, you could end up on your face. This bottom layer is, perhaps, the layer which provides your mat with the most reliability. This yoga mat is hypoallergenic, so you don’t have to worry about the ingredients it was made with irritating your skin. The top layer is made so that it is both not harmful and durable. The very thought of putting memory foam into a mat shows that KindMat is willing to innovate for brand new yoga experiences. The only downside is that if you try a luxurious memory foam yoga mat, you may have a hard time returning to regular hard mats! The major con to the KindMat yoga mat is its price, which usually exceeds even the Manduka PRO mats. 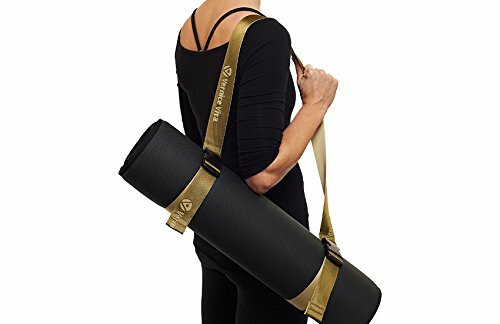 You may not willing to invest that much money in a single yoga mat, but the Hugger Mugger Ultimate Comfort yoga mat is an alternative, slightly less expensive memory foam yoga mat available on the market. The Hugger Mugger Ultimate Comfort yoga mat costs about two-thirds the price of the KindMat yoga mat, while still having many of the same benefits. Again, though, perhaps you get what you pay for. The Hugger Mugger Mat is also a memory foam mat but without the three-layer design. 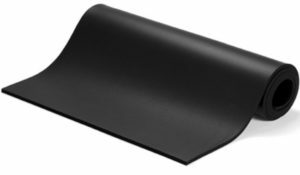 The Hugger Mugger mat uses a 3/8-inch (9.5 mm) thick memory foam. This is much thinner than the KindMat. Still, the memory foam provides more comfort than traditional yoga mats. The compression of the foam also provides a better grip in that your hands create indentations or grooves that help to hold you in place. However, both the cushioning and indentation are of course less than in the thicker KindMat. Like the KindMat, the Hugger Mugger Ultimate Comfort yoga mat is eco-friendly and free of pthalates. Memory foam is not cheap, and the Hugger Mugger Ultimate Comfort mat, while cheaper than KindMat’s offering, is still one of the more expensive yoga mats you can buy. Our general feeling is that if you want to get a high-end experience, you might as well just pay for the best product and get the KindMat. Otherwise, what’s the point of paying extra but getting half the quality? Still, the Hugger Mugger mat is the only alternative for true memory foam that we can recommend. Either the KindMat or Hugger Mugger are great gifts for yourself or another yogi.